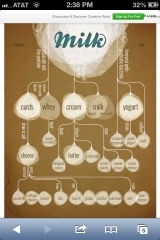 This is an interesting infographic on milk, and it's derivatives. I've wondered about choices of what to do with milk, and what food comes from which process. Different parts of the world have different names for quite similar foods. Yogurt, in many areas of the world known by different names, is one example. It looks to me geography had a bit to do with what happened to milk. Cooler areas could age cheeses, hotter climates developed variations on yogurt. Farmers today have the entire chart to choose from. Milk can be made into any of these anywhere in the world now. And into at least one more thing not on this infographic: my favorite, ice cream.